CEO of ChildFund Ireland, Mick Kiely, was delighted to be present at the United National General Assembly side event in New York yesterday. The event, which was hosted by the Irish government together with the governments of Benin, Indonesia, Paraguay and Sweden was calling on the UN member states to ensure a World Free from Violence and Exploitation against Children by including specific targets and indicators in the Post-2015 Development Agenda. 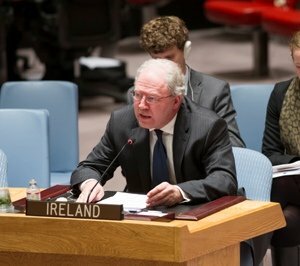 During the event, Mr. David Donoghue, Permanent Representative of Ireland to the United Nations, announced that the previous day, on the 25th anniversary of the establishment of the UN Child Rights Committee, the Minister for Foreign Affairs, Mr. Charlie Flanagan, had signed and ratified Optional Protocol 3 of the UN Convention on the Rights of the Child. Optional Protocol 3, which was adopted by the General Assembly in January 2012 and entered into force in April this year, established a complaints procedure for violations of the child rights which are contained in the Convention on the Rights of the Child and the first two optional protocols. The full text of the Optional Protocol 3 is available here . In November, we shall celebrate twenty five years of the Convention of the Rights of the Child which was unanimously adopted by the General Assembly on 29th November 1989.